So went the marketing for the Pālolo Hill development – the Homeland of Health – above Kaimuki. Some background … William Lunalilo ended up with most of the area known as Kaimuki through the Great Māhele (1848.) Lunalilo was born on January 31, 1835 to High Chiefess Miriam ‘Auhea Kekauluohi (Kuhina Nui, or Premier of the Hawaiian Kingdom and niece of Kamehameha I) and High Chief Charles Kanaʻina. Lunalilo was the first of the large landholding aliʻi to create a charitable trust for the benefit of his people. He was to reign for one year and twenty-five days, succumbing to pulmonary tuberculosis on February 3, 1874. His estate included large landholdings on the five major islands, consisting of 33-ahupuaʻa, nine ʻili and more than a dozen home lots. His will, written in 1871, established a perpetual trust under the administration of three trustees to be appointed by the justices of the Hawaiian Supreme Court. Gear, Lansing & Co, one of Honolulu’s first real estate firms, envisioned Kaimuki becoming a high-class residential area, but was stymied by buyers’ lack of interest. Not familiar with the Pālolo Hill subdivision name? Up Pālolo Hill (Wilhelmina Rise,) you’ll find Lurline, Matsonia, Maunalani, Mana, Sierra, Wilhelmina, and Claudine, Matson liners and freighters. 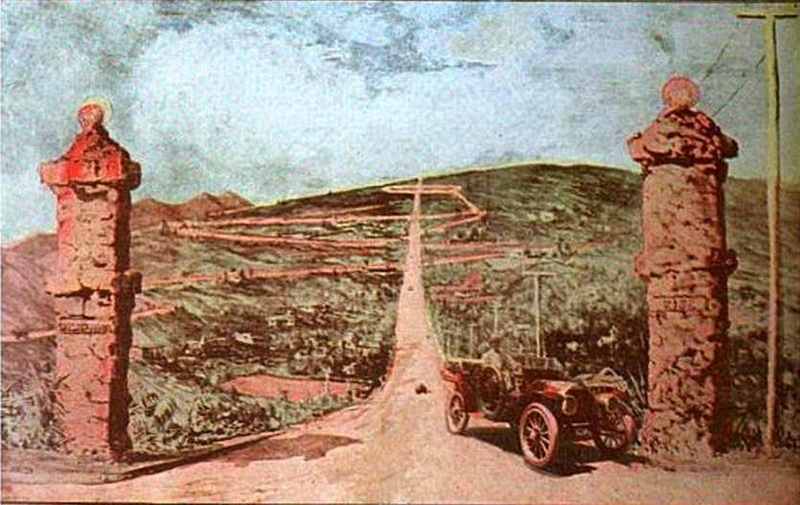 The image shows a drawing of the new Pālolo Hill development (Mid-Pacific Magazine, 1912.) In addition, I have included more related images in a folder of like name in the Photos section on my Facebook and Google+ pages. Alexander was the idea man, more outgoing and adventurous of the two. He had a gift for raising money to support his business projects. Baldwin was more reserved and considered the “doer” of the partners; he completed the projects conceived by Alexander. After studying on the Mainland, Alexander returned to Maui and began teaching at Lahainaluna, where he and his students successfully grew sugar cane and bananas. 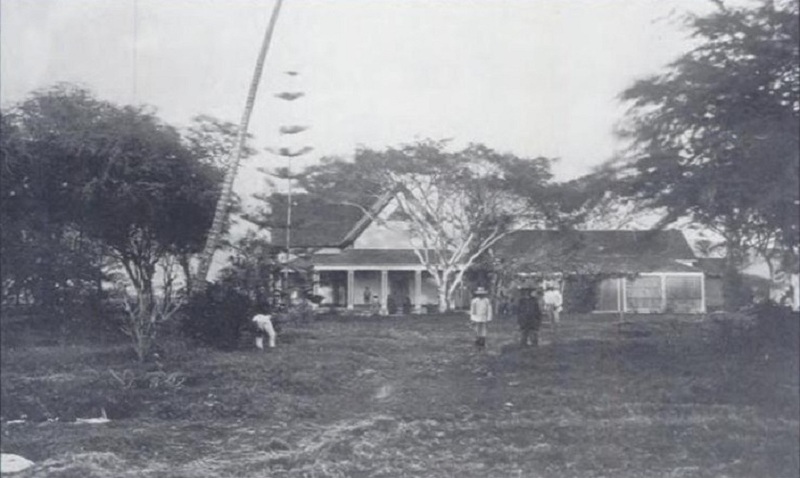 Word of the venture spread to the owner of Waiheʻe sugar plantation near Wailuku, and Alexander was offered the manager’s position. Alexander hired Baldwin as his assistant, who at the time was helping his brother raise sugar cane in Lāhainā. This was the beginning of a lifelong working partnership. In 1871, they saw the need for a reliable source of water, and to this end undertook the construction of the Hāmākua ditch in 1876. Although not an engineer, Alexander devised an irrigation system that would bring water from the windward slopes of Haleakala to Central Maui to irrigate 3,000 acres of cane – their own and neighboring plantations. Baldwin oversaw the Hāmākua Ditch project, known today as East Maui Irrigation Company (the oldest subsidiary of A&B,) and within two years the ditch was complete. The completed Old Hāmākua Ditch was 17-miles long and had a capacity of 60-million gallons per day. A second ditch was added, the Spreckels Ditch; when completed, it was 30-miles long with a capacity of 60-million gallons per day. Before World War I, the New Hāmākua, Koʻolau, New Haiku and Kauhikoa ditches were built. A total of ten ditches were constructed between 1879 and 1923. Over the next thirty years, the two men became agents for nearly a dozen plantations and expanded their plantation interests by acquiring Hawaiian Commercial & Sugar Company and Kahului Railroad. In 1883, Alexander and Baldwin formalized their partnership by incorporating their sugar business as the Paia Plantation also known at various times as Samuel T Alexander & Co, Haleakala Sugar Co and Alexander & Baldwin Plantation. The Articles of Association and affidavit of the president, secretary and treasurer were filed June 30, 1900 with the treasurer of the Territory of Hawaiʻi. Alexander & Baldwin, Limited became a Hawaiʻi corporation, with its principal office in Honolulu and with a branch office in San Francisco. Shortly after, in 1904, Samuel Alexander passed away on one of his adventures. While hiking with his daughter to the edge of Victoria Falls, Africa, he was struck by a boulder. Seven years later, Baldwin passed away at the age of 68 from failing health. After the passing of the founders, Alexander & Baldwin continued to expand their sugar operations by acquiring additional land, developing essential water resources and investing in shipping (Matson) to bring supplies to Hawaii and transport sugar to the US Mainland markets. What started off as partnership between two young men, with the purchase of 12 acres in Maui, has grown into a corporation with $2.3 billion in assets, including over 88,000 acres of land. A&B is the State’s fourth largest private landowner, and is one of the State’s most active real estate investors. It’s portfolio includes a diversity of projects throughout Hawaiʻi, and a commercial property portfolio comprising nearly 8-million square feet of leasable space in Hawaiʻi and on the US Mainland. The image shows the sugar harvesting in the early years. (A&B) In addition, I have added some other images in a folder of like name in the Photos section on my Facebook and Google+ pages. 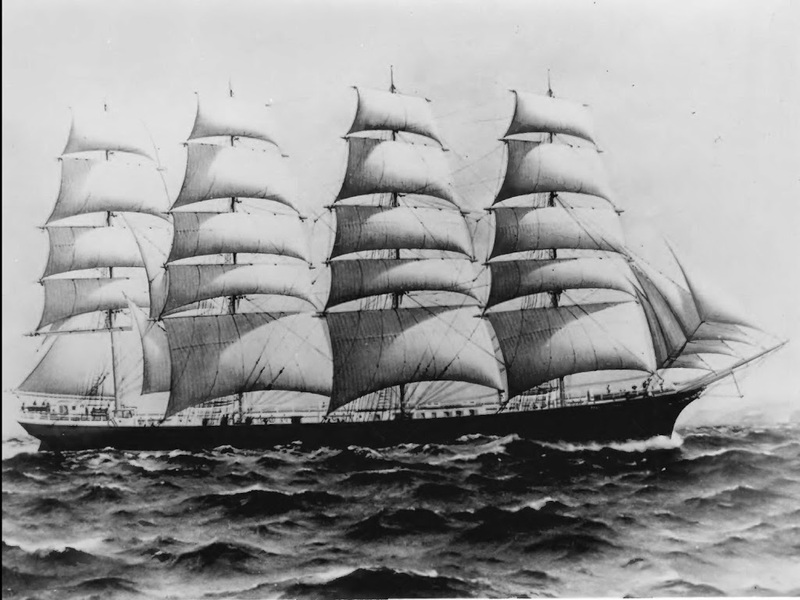 She was launched December 12, 1878 by shipbuilders Russell & Co at Port Glasgow, Scotland; the four-masted, full-rigged ship Falls of Clyde became part of the Falls Line fleet – all of which were named after Scottish waterfalls. Falls of Clyde has a wrought-iron hull with a net tonnage of 1,748 tons and has a registered length of 266-feet, with a 40-foot beam and a 23.5-foot depth of hold. Used for trade between Britain and India, the ship was under the British flag and journeyed into the Pacific, stopping at Australia, New Zealand, Bangkok, Hong Kong and Shanghai. Falls of Clyde made 10 voyages to American ports while under the British flag. Sailing to San Francisco and Portland for wheat, she also made one voyage to New York. The voyages to San Francisco were particularly important, for they involved the ship in one of the United States and Britain’s most significant maritime trades, the California grain trade. She was later sold to Captain William Matson in 1898 with plans to be used for the lucrative sugar trade between Hawaiʻi and the continent. However, according to US law, Falls of Clyde needed American registry to trade between American ports, a right denied to foreign-built and registered vessels. Converted to US registry, Falls of Clyde then was involved in the Hawaiian transpacific sugar trade for Matson Navigation Co. She carried people, too. Her cargo hold was not limited to the sugar plantation business; just as modern Matson ships bring in assorted cargo that fill a variety of shelves across the islands, the Falls of Clyde supplied the Islands with various goods that filled the needs of the past. The four-masted vessel, originally rigged as a ship, was down-rigged to a bark; in addition, Matson modified and built a large wooden deckhouse forward and a charthouse on the poop deck. She carried sugar from Hilo to San Francisco until 1906 when the Associated Oil Company (a group of 45 independent oil producers in which Matson had an interest) bought the ship and in 1907 Falls of Clyde was once again modified when she was converted into a sailing oil tanker. Associated Oil added 10-tanks within the hull, a boiler room and a pump room with a carrying capacity close to 750,000-gallons. She also carried molasses from Hilo to San Francisco over the next 13 years. In 1921, she was sold to the General Petroleum Corporation who, after dismasting, then used her as a floating petroleum barge in Ketchikan, Alaska. General Petroleum reorganized as Socony-Vacuum (now Mobil Oil) in 1959 and developed new shore facilities at Ketchikan. No longer needed, Falls of Clyde was again sold and towed to Seattle, and laid up. After several attempts to save the ship of the fate of being scuttled as a breakwater, a group of civic and historic-minded folks in Hawaiʻi, aided by funds from the Matson Navigation Co. and other donations (spearheaded by the Friends of Falls of Clyde,) purchased and returned the ship to Honolulu in 1963. With lots of voluntary help she was restored, remasted and rerigged and, under management of Bishop Museum, in 1970 she was opened to the public at Pier 5. Damaged by Hurricane Iwa in 1982, she was moved to Pier 7, and over the course of a few years she was restored and became the centerpiece of the Hawaiʻi Maritime Center, moored at Pier 7 in Honolulu Harbor. Maintaining any boat is expensive, particularly one that dates to the late-1800s. By early 2008, after receiving an estimate of at least $30-million to restore the ship, Bishop Museum issued a contract to remove all valuable items from the ship including a priceless figurehead, to dismantle the rigging, and to prepare the Falls of Clyde to be towed out to sea for scuttling. The Friends needs your help. Join their group on Facebook. More importantly, visit their site and offer to volunteer or donate. It looks like the Friends are planning to haul her out for a much needed drydock. The image shows Falls of Clyde (NPS;) in addition, I have added some other images in a folder of like name in the Photos section on my Facebook and Google+ pages. In 1935, as part of the New Deal initiatives, Congress passed the Wagner Act legalizing workers’ rights to join and be represented by labor unions. In Hawaiʻi, business was dominated by the Big Five: Alexander & Baldwin, C. Brewer, Castle & Cooke, AmFac and Theo. Davies. Nearly everything of significance, from banks to shipping lines and sugar plantations to newspapers, was tightly controlled by the Big Five. One third of the population of the islands was living on the plantations, with seventy percent of the people directly dependent on plantation economy. The Hilo Longshoremen’s Association was formed on November 22, 1935, when about 30 young longshoremen of almost every ethnic and racial origin common to the territory agreed to join forces and organize all the waterfront workers regardless of race or national origin. By the summer of 1937, with the help of the longshoremen, Hilo had the following unions: Hilo Laundry Workers’ Association, Hilo Longshoremen’s Association, Hilo Canec Association, Hilo Clerks’ Association, Hilo Railroad Association and the Honuʻapo Longshoremen’s Association. By 1938, during the height of the Great Depression, labor discontent escalated over low pay and poor working conditions. Negotiations were underway between the unions and employers on two major issues: 1) parity or equity of wages and conditions with the West Coast workers; and 2) the closed or union shop or some kind preferential hiring arrangement. But Hawai’i employers were committed to fight the issue of wage parity or mainland wage standards in every industry as a matter of principle. The Hilo Longshoremen’s Association struck against the Inter-Island Steamship Navigation Co. The Inter-Island Steam Navigation Co., Ltd. had been controlled since 1925 by Matson Navigation and Castle & Cooke, the days before commercial airline transport between the islands. Its ships carried virtually all passenger and light freight traffic. After three weeks of striking, the unions had decided to fall back somewhat and draw their line at the return of the two larger ships, the SS Waiʻaleʻale and the SS Hualalai. Inter-Island scheduled another return of the Waiʻaleʻale to Hilo Harbor. Expecting confrontation, the night before the scheduled arrival, nearly 70-Police officers and special volunteer deputies began to assemble at the wharf to be sure that the union men would not get there before they did. They had a small arsenal of 52-riot guns with bayonets, 4-Thompson sub-machine guns, tear gas grenades and an adequate supply of ammunition including both buckshot and birdshot cartridges for the riot guns. In addition, the Hilo Fire Department was assigned to dispatch a pumping truck and enough firemen as might be needed to repulse the marchers with water hoses. The Waiʻaleʻale was expected around 9 am on August 1, 1938. Some of the longshoremen started to gather as early as 6:30 am, and by 8:30 the majority of the unionists began to arrive. 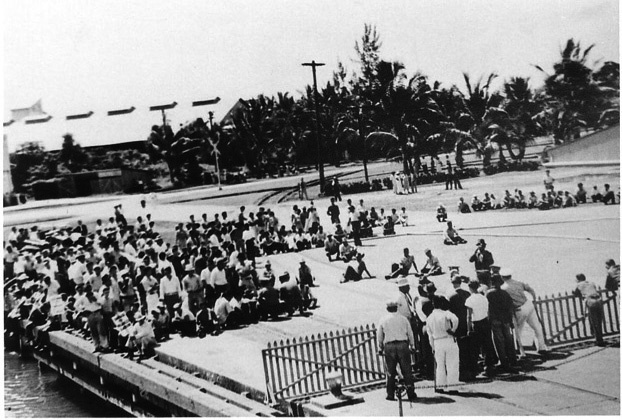 Over two hundred men and women belonging to several different labor unions attempted to peacefully demonstrate against the arrival of the SS Waiʻaleʻale in Hilo. They were met by a force of police officers who tear gassed, hosed and finally fired their riot guns into the crowd. In the scuffle, at least 16 rounds of ammunition were fired: seven birdshot and nine buckshot. When it was over, fifty people, including two women and two children, had been shot; at least one man bayoneted and another’s jaw nearly broken for speaking up for his fallen brother. In the confusion and uncertainty of the moment, the remaining, uninjured unionists left the docks Monday afternoon and the Waiʻaleʻale was unloaded without incident. But that night a rally was held at Moʻoheau Park which was attended by a huge crowd. Reminiscent of the violence unleashed in the West Coast Strike four years earlier, the Hilo shooting closely paralleled the San Francisco police attack of July 5th that had left two strikers slain and a hundred others wounded. The West Coast event had been called Bloody Thursday; here, they were already calling August 1st Hilo’s Bloody Monday. The strike was soon settled. A Grand Jury found: “That evidence is not sufficient to warrant an indictment against any person or group of persons”. The union subsequently filed a lawsuit for damages, which they lost. The image shows the gathering of sides at Hilo Harbor. In addition, I have included other related images in a folder of like name in the Photos section on my Facebook and Google+ pages.